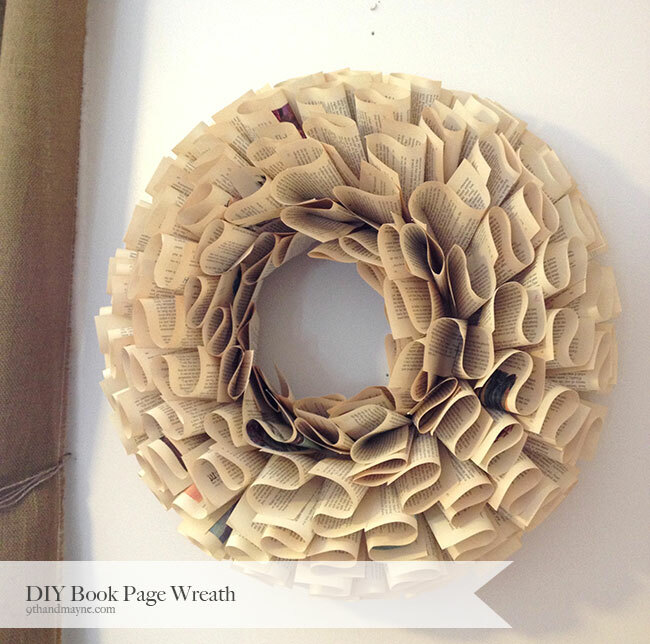 You’ve probably seen book page wreaths around the web and if you’re like me….you/I love them! I love the way they look and I loved making this! 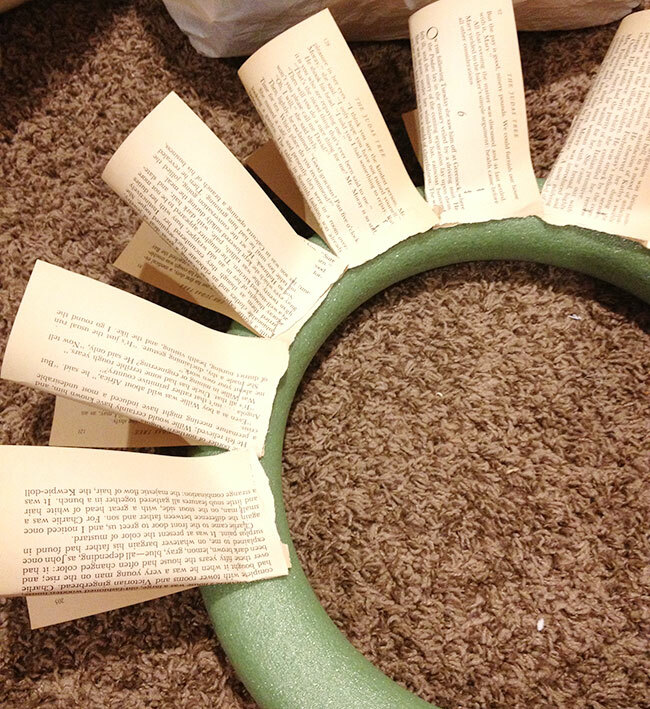 I used the tutorial on Makely School for Girls for my book page wreath. Lindsay did a great job on her tutorial, every step is covered (not like mine. i always forget to take pictures!). 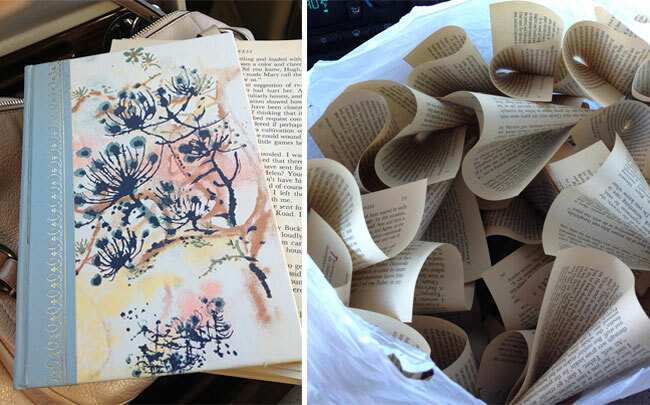 I bought a book at the DI for $1 and got busy tearing it apart. I stapled each page so it would be easier to glue on, not necessary tho. I called this my ‘carpool craft’ because I did most of the tearing and stapling while I waited for kiddos to get to the car. I glued a round of pages on the back of the floral ring, then I flipped it over and started filling in. I’m not sure how long it took to glue the pages on but I’m pretty sure it was an hour or so. I’m thrilled with the way it turned out! I love how it looks! Some of my pages had little pictures so I tried to spread them out. I really like the added color here and there. I think I’ll start looking for a shutter to hang it on, like Holly Mathis…cuz, she rocks all interiors! Love her style! I absolute ADORE wreaths (and flowers!) 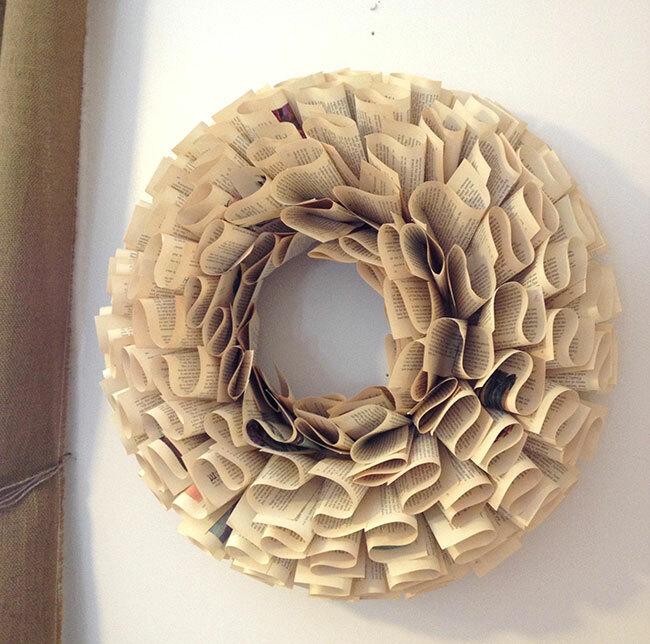 made from old book pages! Your wreath turned out wonderful! BTW: reading through the previous posts I was delighted to discover that I am not the only one who choose the word ‘work’ for 2013′ though I honed my word to be CREATIVE WORK. I will be sure to check in and see how your year of work is progressing – I’m sure it will inspire to continue on my CREATIVE WORK path! So, so, so pretty. And I like the pops of color too! Glad I popped by! Thanks Sarah!! I wasn’t sure of the pictured pages but after it was done, I loved it! I love it .. leave the legs alone.